Employee Assistance Programs Blog: America's First and #1 EAP Blog*: Can Your EAP Change Employee Attitudes and Create a More Positive Workforce? Can Your EAP Change Employee Attitudes and Create a More Positive Workforce? 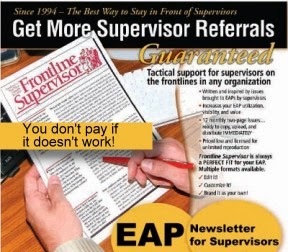 There is one thing seldom discussed as a powerful purpose for having an EAP employee newsletter authored by an EAP peer. In fact, I seldom mention in it my own promotional literature about Frontline Employee. This one thing can improve productivity, reduce the risk of violence, reduce complaints to HR, and produce a more positive workplace. The topic is changing and creating more positive attitudes among employees. There are thousand ways to go with this topic, but your employee newsletter is a powerful vehicle for delivering this sort of change to your organization. Don't forget this topic in your newsletter. I can't think of a more cost-beneficial reason to have a workforce wellness or employee newsletter. So, I decided to blog about. And, frankly, this is why I attend to this topic regularly in our content throughout the year. Insert purposeful articles on this topic about 7-8 times per year. 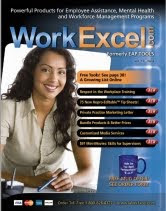 Doing so will cause your organization to reap powerful benefits as people think about the content and seek to apply it. A positive attitude controls our lives. It enhances our relationships. And it impacts our productivity, both in quantity and quality. I discovered this years ago, and it is why I decided to write about this subject in our employee newsletters about 3-4 times per year. Did you know that Stanford researchers are making the case that attitude is more important than IQ. Yes, this in addition to the whole emotional IQ discussion. This is good news, and there are a lot of implications for workplace productivity in this declaration. The good news? Attitude is easier to change than I.Q. and it has significant financial payoffs. Start with helping employees understand “mindset.” Either you have a mindset that is “fixed” or your mindset is “growth-oriented,” says researcher, Carol Dweck, Ph.D. A fixed mindset means you’re not very open to change or willing to adapt to it. You don’t view mistakes as opportunities or stepping-stones to your success. People with a growth mindset do. Hey, this is not genetic. This is a learned behavior. Sure, this is also a habit, but habits are changed to the degree new beliefs are acquired, and your employee newsletter should therefore target these concepts. (We do. 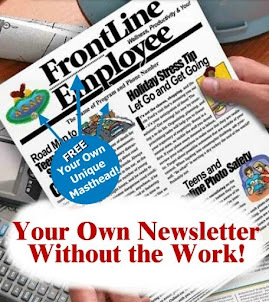 Click here to get three free back issues of Frontline Employee so you can see what I am talking about.) I will send you Dartmouth College's newsletter. We started writing Dartmouth's newsletter about ten years ago. They love us. If you need, I will refer to the EAP Director there for a testimonial. One powerful article (try this idea) is helping employees look at Thomas Edison's attitude—he kept trying hundreds of times (actually about 1000) before the bulb finally glowed. Also, help employees look at the idea of embracing challenges. Also, what does it mean to persist in the face of setbacks--discuss this idea, too. Help employees plot a path to mastery of a skill or ability that will advance their career. Help them see criticism as gift. (There's a biggie.) Learning from criticism to achieve something more really requires an open mindset. I won't digress too far, but this whole positivism idea flows over into improved workplace communication -- both more civility in communication and more of it. That's right. When attitudes are poor, some people communicate less. Pose the question in the beginning of your article of whether the reader has an open or closed mindset. You can find a deeper discussion about this topic if you purchase the book “Mindset: The New Psychology of Success,” by Carol Dweck, Ph.D. - I quick skim will give you a bunch of ideas for articles associated with this topic.